We have been the cutting tool technology and performance leader in our field for over 90 years. 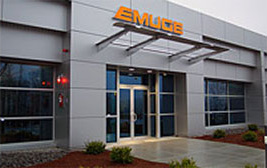 Emuge manufactures an exhaustive line of taps, end mills, thread mills, carbide drills, tool holders, clamping devices and attachments, over 10,000 items sold through distributors throughout the US & Canada and worldwide. Our goal is simple: manufacture the highest quality and most innovative products possible to help our customers reduce their costs of manufacturing.